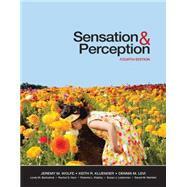 by Wolfe, Jeremy M.; Kluender, Keith R.; Levi, Dennis M.; Bartoshuk, Linda M.; Herz, Rachel S.; Klatzky, Roberta L.; Lederman, Susan J.; Merfeld, Daniel M.
Sensation & Perception, Fourth Edition, introduces students to their own senses. Human sensory and perceptual experience is emphasized, and the neuroscientific underpinnings of that experience introduced. By integrating current findings alongside the basics, the authors impart to students that these are active areas of research. The Fourth Edition features an emphasis on Sensation & Perception in Everyday Life; this new box feature discusses a perceptual impairment or real-world application related to the chapter topic. The text provides comprehensive treatment of higher perceptual/cognitive functions (e.g., attention, music, language) as well as expert coverage of sensory systems beyond vision and audition (including, notably, a full chapter on The Vestibular System and Our Sense of Equilibrium and separate chapters on Taste and Olfaction). New material ranges from the latest neuroscience to medical applications to philosophical considerations. The book strives for a conversational tone that unites the voices of several domain specialists into a unified story of the human senses. *Activities lead the student through important processes, phenomena, and structures (e.g., perception experiments, illusions, and models of cognitive processes). New for the Fourth Edition, each activity is accompanied by a brief quiz, which can be assigned by the instructor. *Web Essays expand on selected topics from the textbook and provide additional coverage and examples. *Study Questions give students the opportunity to test their mastery of the important concepts, processes, and terminology presented in the chapter. *Flashcards & Key Terms help the student master the hundreds of new terms introduced in the textbook. *Chapter Summary Activities combine a detailed overview of each chapter's content with a fill-in-the-blanks exercise to check comprehension. *Textbook Figures and Tables: All of the figures (including photographs) and tables from the textbook, sized and color-adjusted for optimal legibility when projected. *PowerPoint Resources: Two presentations are provided for each chapter. One contains all of the chapter's figures and tables, the other is a complete lecture presentation outline, with selected figures included. *Chapter Overview: Provides the big-picture synopsis of what each chapter covers. *Chapter Outline: The outline structure of the chapter, including all headings. *Chapter Summary: A detailed breakdown of all the important concepts presented in the chapter. *Lecture Outline: A suggested lecture for each chapter, presented in a slide-by-slide format designed for use in PowerPoint presentations. *References for Lecture Development: A list of references for additional reading on the topics presented in each chapter. *Test Bank: The Test Bank provides instructors with a full range of test questions for each chapter of the textbook, provided in Microsoft Wordformat. Both factual recall and conceptual questions are included, and some questions include diagrams. New for the Fourth Edition, each chapter includes a set of short-answer and essay questions, with answers. *Computerized Test Bank: The Test Bank is also provided in Diploma format (software included). Diploma is a powerful, easy-to-use exam creation program that lets you quickly assemble exams using any combination of publisher-provided questions and your own questions. Jeremy M. Wolfe is Professor of Ophthalmology & Radiology at Harvard Medical School. Dr. Wolfe was trained as a vision researcher/experimental psychologist and remains one today. His early work includes papers on binocular vision, adaptation, and accommodation. The bulk of his recent work has dealt with visual search and visual attention in the lab and in real world settings such as airport security and cancer screening. He taught Introductory Psychology for over twenty-five years at the Massachusetts Institute of Technology, where he won the Baker Memorial Prize for undergraduate teaching in 1989. He directs the Visual Attention Lab and the Center for Advanced Medical Imaging of Brigham & Women's Hospital. Keith R. Kluender is Professor and Head of Speech, Language, and Hearing Sciences and Professor of Psychological Sciences at Purdue University. His research encompasses: how people hear complex sounds such as speech; how experience shapes the way we hear; how what we hear guides our actions and communication; clinical problems of hearing impairment or language delay; and practical concerns about computer speech recognition and hearing aid design. Dr. Kluender is deeply committed to teaching, and has taught a wide array of courses: philosophical, psychological, and physiological. Dennis M. Levi has taught at the University of California, Berkeley since 2001. He is Professor in the School of Optometry and Professor at the Helen Wills Neuroscience Institute. In the lab, Dr. Levi and colleagues use psychophysics, computational modeling, and brain imaging (fMRI) to study the neural mechanisms of normal pattern vision in humans, and to learn how they are degraded by abnormal visual experience (amblyopia). Linda M. Bartoshuk is Bushnell Professor, Department of Food Science and Human Nutrition at the University of Florida. Her research on taste has opened up broad new avenues for further study, establishing the impact of both genetic and pathological variation in taste on food preferences, diet, and health. She discovered that taste normally inhibits other oral sensations such that damage to taste leads to unexpected consequences like weight gain and intensified oral pain. Most recently, working with colleagues in Horticulture, her group found that a considerable amount of the sweetness in fruit is actually produced by interactions between taste and olfaction in the brain. This may lead to a new way to reduce sugar in foods and beverages. Rachel S. Herz is Adjunct Assistant Professor in the Department of Psychiatry and Human Behavior at Brown University and Part-time Faculty in the Psychology Department at Boston College. Her research focuses on a number of facets of olfactory cognition and perception and on emotion, memory, and motivated behavior. Using an experimental approach grounded in evolutionary theory and incorporating both cognitive-behavioral and neuropsychological techniques, Dr. Herz aims to understand how biological mechanisms and cognitive processes interact to influence perception, cognition, and behavior. Roberta L. Klatzky is the Charles J. Queenan Jr. Professor of Psychology at Carnegie Mellon University, where she also holds faculty appointments in the Center for the Neural Basis of Cognition and the Human-Computer Interaction Institute. She has done extensive research on haptic and visual object recognition, space perception and spatial thinking, and motor performance. Her work has application to haptic interfaces, navigation aids for the blind, image-guided surgery, teleoperation, and virtual environments. Susan J. Lederman is Professor Emerita of Psychology at Queen's University, with cross-appointments in the Centre for Neuroscience and in the School of Computing. Her research interests span both perception and cognition, with particular emphases on psychophysics, haptic perception and recognition of objects and their underlying neural processes and representations, multisensory perception, and sensory-guided motor control. She has applied the results of her research to a number of real-world problems, including the design of haptic and multisensory interfaces for virtual environments and teleoperation. Daniel M. Merfeld is a Professor of Otology and Laryngology at the Harvard Medical School with appointments at the Harvard-MIT Health, Science, and Technology program and the Harvard School of Engineering and Applied Science. He is also the Director of the Jenks Vestibular Physiology Laboratory at the Massachusetts Eye and Ear Infirmary. Much of his research career has been spent studying how the brain combines information from multiple sources, with a specific focus on how the brain processes ambiguous sensory information from the vestibular system in the presence of noise. Translational work includes research developing new methods to help diagnose patients experiencing vestibular symptoms and research developing vestibular implants for patients who have severe problems with their vestibular labyrinth.